We've also heard a lot of negative stuff about facial recognition technology. Now picture it from a blind person's perspective - "Hey Alice, I can see your friend Bob". 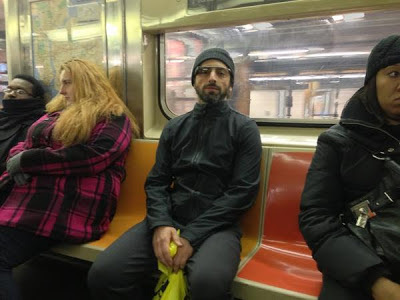 Let's imagine that we went one step further and added some opt-in location awareness a la Google Latitude, then your glasses could even help you to meet up with a blind friend. "Hey Bob, Alice is two blocks away from you. There's a locally run independent artisanal coffee shop coming up in 100 metres where we could meet - shall I send him the location and use their API to order us both a tall skinny mocaccino?" For some more practical examples of how Glass could help blind and partially sighted people with independent living, let's imagine that I am blind and aiming to catch a train to London. How could Glass help me out? OK, Glass: When is the next train to London? OK, Glass: Which bus route is best to get me from here to the train station? OK, Glass: Am I holding my train ticket the right way up for the barriers? OK, Glass: Which platform is my train leaving from, and is it on time? Android, the open source Linux distribution running on 750 million smartphones and tablets, is also the technology underpinning Glass. It will be interesting to see how much of the Glass software Google make open source - it's easy to picture other Glass type products appearing that use Android but aren't aligned to the Google ecosystem, a business model already proven by Amazon with the Kindle Fire, and numerous Android devices in mainland China. What's the big deal about Android? Well, bear in mind that much of I have described above is already possible with existing apps and APIs on Android and those achingly fashionable open data feeds - it's just a bit impractical unless you strap your phone to your head, or something like that. The science fiction part (for now - but perhaps you can change that, dear reader!) is the bit where Glass "directs" you in real time by processing the camera imagery, e.g. to the exact bit of the train where the door can be found, or your reserved seat. But if you think about it, optical character recognition of images has already been demo'd to great effect by Google Googles and there are some interesting pointers from the lesser known but seriously awesome The vOICe for Android. To get a feel for potential revolutionary applications for Google Glass, just try walking around for a while with your eyes closed! See how I managed to get this far without mentioning collision avoidance?